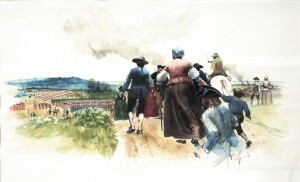 “The World Turned Upside Down,” a 1981 watercolor painting by Arthur Shilstone, depicts the October 19, 1781, British surrender at Yorktown. Jamestown-Yorktown Foundation Collection. As news of the surrender of Cornwallis’s army spread, numerous victory celebrations were held throughout the country. Some were marked with solemn sermons, while others featured the consumption of quantities of “spirits.” Despite the joyous celebrations however, most Americans at the time did not assume that the struggle for independence was won, and few even viewed the events of October 19 as particularly decisive until some time later. Little indication can be found in the diary entries and letters written after Yorktown for example, even by the members of the Continental Congress, to suggest that anyone believed the war was soon coming to an end. They were right of course. The war, and to some extent the fighting, continued for some time. The western frontier still saw conflict between Indians who supported the British cause and American settlers, and numerous skirmishes continued to be fought in New Jersey, New York and the Carolinas, primarily between patriot militia forces and organized groups of loyalists. The Yorktown campaign, however, was the last significant military engagement involving British regular forces and the Continental Army. 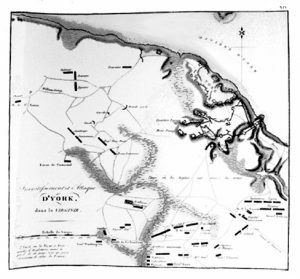 The French plan of entrenchments at Yorktown in 1781. Jamestown-Yorktown Foundation Collection. Nevertheless, the Revolution was not over. It would be another two years before America’s independence was assured. Even after the surrender of Cornwallis’s army at Yorktown, the British still maintained about 30,000 troops in America. By early November, the grand allied army at Yorktown had dispersed. Some French regiments returned to the Caribbean with De Grasse’s fleet; Washington and his Continental soldiers marched back north to resume their stand-off with the British in New York; the militia went home; and only Rochambeau’s four regiments of French infantry remained to spend the winter in eastern Virginia. The most immediate result of the British defeat at Yorktown therefore was a stalemate in the South, much like the one that had existed in the North since 1780. The British still occupied New York City, Charleston, South Carolina, and Savannah, Georgia, as well as Canada and parts of Florida. British forces in North America outnumbered those that the allies could muster, and even in the lower South the British had more troops than General Nathanael Greene commanded. There was no question that if they chose to, the British could continue to occupy their coastal bases indefinitely. It was equally obvious however that they were apparently unable to destroy the Continental Army or to conquer the rebellious colonies. It was unrealistic, and perhaps unwise, for the Americans to expect the French to send a large enough force to take New York and equally unlikely to expect the bankrupt Congress to fund a large enough army for General George Washington to do the job. It now seemed that the decisive arena of the war lay not in North America, or even in the West Indies where the combined Spanish and French fleets outnumbered what ships the British could afford to send, but elsewhere. The decisive point of the war now revolved around the strategic goals of the three major European powers. The victory at Yorktown encouraged France to continue fighting, and neither France nor Spain was ready to make peace since they had not yet achieved their basic aims. The French still hoped to win more victories and reduce Great Britain’s power, while Spain still hoped to capture Gibraltar. Great Britain, on the other hand, was fighting too many enemies in too many places. The British had been fighting a world war for several years, and the goal of subduing the Americans began to become secondary in importance compared to that of defending the homeland and far-flung interests in the West Indies, India and elsewhere. Up until the loss of Cornwallis’s army, Parliament had supported the war in America, but after Yorktown there was a growing body of opinion that the six-year-long attempt to conquer the former colonies had failed. The four years from October 1777 to October 1781 had seen two entire British armies lost in the American theater. The costs of continuing the war were rising, and the result was an increasingly heavy tax burden on the middle classes, which controlled the balance of power in the House of Commons. King George III was still determined to continue the effort to suppress the American rebellion, but the opposition party in the Commons began to gain support from the critical group of lukewarm government supporters. By early 1782 the opposition began a campaign of motions and votes that gradually eroded Lord North’s majority in the House of Commons. By March Lord North had been forced to resign as prime minister. Although the new ministry did not immediately end the war, it did open the way for preliminary peace negotiations with the United States. Another 16 months were to pass before final peace treaties were concluded and ratified, but by November 1782 the British had conceded the most critical issue – the independence of the United States. With Parliament unwilling to continue the war against the United States, the king was forced to accept the loss of the former 13 colonies. By detaching the Americans from the worldwide war, the British were able to concentrate on their main foes, France and Spain. The final peace treaties were signed in September 1783, and on November 25 the British army left New York City, their last military base in the new nation. A recent study of the Yorktown campaign concludes that it was “one of those relatively minor events which have disproportionate effects, because it brought the participants’ minds to the point of the larger decision of whether to continue the war.” The allied victory at Yorktown seems to have been the final straw for Great Britain, which finally accepted the existence of the new American nation.